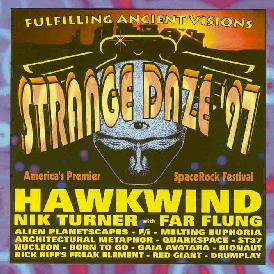 Due to some miscommunication, we failed to get the SD'97 compilation reviewed in our special Strange Daze section last time. Ironic, eh? Well, let's get that straightened out. Spread over 2 CD's is a fine sampling of the high quality American SpaceRock we've come to enjoy, plus 23 minutes of live Hawkwind and 10 minutes of Nik Turner fronting Farflung. The concept of how these discs were arranged is a little peculiar, as both discs represent full compilations of the 1997 festival undercard. But whereas Disc 1 contains complete versions of each track (1 per artist), Disc 2 (to leave room for the HW and NikFlung portions) offers just some snippets (~30 sec. - 1 min.) of certain tracks. Weirder yet is that some of the tracks are the same, and for other bands different tracks appear on each disc. That given, I've discovered that less than 15 minutes of the total 136 minutes is actually redundant, so you get at least 2 full hours of true music here - not too shabby. And the recording quality is generally very good. Disc 1 starts out with the 90-second "Awakening" by Gaia Avatara, a kind of invocation set to minimal backing, declaring "The Earth is our teacher, our heavenly mother" and the like. The next three tracks sample the heavier side of psychedelia... from the space-punk of Red Giant ("Rooms of Shord") to Nucleon's doomy "Green Acid" to ST37's rompin' stompin' "New Arrival." All strong performances. Next, Paul Eggleston's cosmic synth sounds shine through on ArcMet's "Holographic Caves," one of their strongest tunes. Milwaukee's F/i contribute the uncharacteristically fuzz-less "Evan Walker PIM," a krautish looping riff interspersed with a slower bluesy jam and some nice echoey guitar licks. ArcMet's all-electronic offshoot Bionaut samples the Hawkwind Goddess Stacia's voice (the '73 "Countdown") and builds an interesting pastiche of other odd sounds, beats, and gurgles to make up the peculiar "Re-laminate My Organ Donor Card." Local artist Nick Riff follows with a psych/improv jam ("Pre-Millenium Transmission") which becomes pretty wild and free-form toward the end... nice to see this side of Mr. Riff. California's Melting Euphoria shine brightly with a brief reading of "Harbour of Infinity," perhaps my all-time favorite of their works. Excellent phased guitar soloing from Bobby Clic here. Marc Power of Born to Go gets to introduce his own contribution "Burning Inside," their android love epic and heavy-hitting space march. Strange Daze regulars Quarkspace get to show off their improvisational spacescapes ("Faerienot Space") and once again I am drawn to Dave Wexler's fluid, pickless guitar playing - sehr kosmische! The superb space-jazz stylings of Alien Planetscapes are in top form for "Soft Martian," Dr. Synth taking time off from his vintage e-gear to play an extended flute solo. Disc 1 finally passes into the quiet night with Drumplay's always on-the-spot composition "The Stream," the appropriate cadence as we march on over to Disc 2. As I said earlier, some of the daytime acts managed to work in a second separate track here. Gaia Avatara, ArcMet, and Melting Euphoria each got to add in a minute or two of something new, with three others contributing second full-length tracks. ST37 slip in "Translunar Injection," an outstanding bit of space blanga, both swirly and explosive at once. "Vagabond Unkown" is a more typical sampling of Nick Riff's melodic psych rock, and one of the few instances when you'll hear verses and choruses sung at a Strange Daze festival (though they manage also a mid-song jam session or two for good measure). Alien Planetscapes later return to blaze though another densely-laden fit of psychedelic madness that is known as the "Radiation King." Farflung and Nik Turner appear in the middle of Disc 2, starting off with a mind-numbing starbound ascent (oops, sorry, I should say descent) at "25,000 Feet Per Second." Man, this is *way* out there in space! After only a brief bit of "Soul Herder," NikFlung quickly morph into the old Hawkwind number "Opa-Loka," Nik's flute, Len's synths, and Tommy's guitar all trading off as the hypno-rhythm forges on. Hawkwind's contribution was saved for last naturally, and while strong as always, the choice of "Assassins of Allah" and "Brainstorm" are less than exciting - how many versions is that now? OK, well, I really like the splicing of "Space is Their (Palestine)" into the former, and of course, Nik was brought out to join in on the "Brainstorm/In Your Area" encore, so that makes sense to use. But I'd rather have had something rarer like "Wheels" or "Reptoid Vision" archived here. Oh well, just a minor issue. Well, if you want to compare this item with something similar, like the old Flicknife festy compilation T.A.T., this Strange Daze one wins hands down! American SpaceRock is alive and well, and now after two more events here in Ohio (with more to come) I can assure you that it's not going away any time soon. Many of these groups are just now entering the marketplace with studio-recorded output, so undoubtedly we'll see lots of great SpaceRock of the homegrown variety appearing soon (well, it's already happening, innit?). So anyway, this compilation of two wonderful days in rural upstate New York is a "must have," if you hadn't already figured that out. Sadly, I wasn't there in person to witness the event (I was somewhere in the Himalaya with my kadu flyer), so I'm especially glad to hear what I missed. Because the track order is not given specifically for Disc 2, here it is for you: 1) Intro (? ), 2) Gaia Avatara, 3) Nucleon, 4) ST 37, 5) F/i, 6) Red Giant, 7-9) Farflung/Nik Turner, 10) Bionaut, 11) Nick Riff, 12) Born to Go, 13) Quarkspace, 14) Drumplay, 15) ArcMet, 16) Alien Planetscapes, 17) Melting Euphoria, 18-20) Hawkwind. For more information on the Strange Daze festivals you can visit the Strange Trips web site.